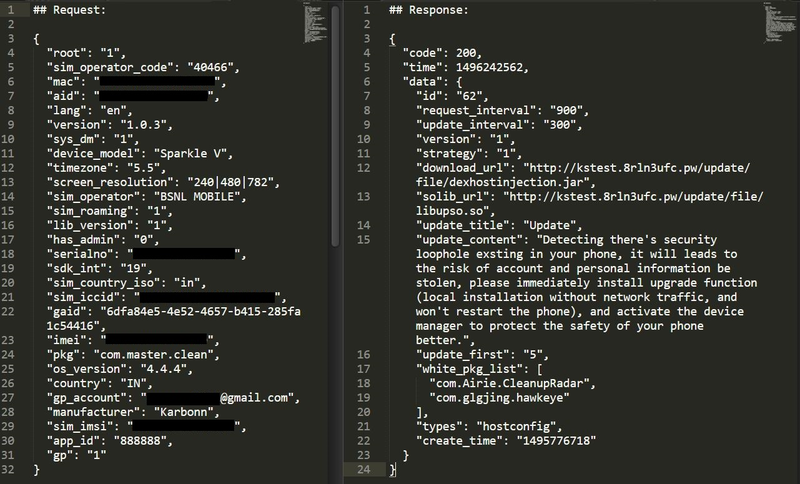 The Zscaler ThreatLabZ team recently identified an Android app that was downloading itself from advertisements posted on forums. Malvertising is a growing problem and one that we have covered on past occasions, especially given the rise in SSL sites that serve malicious ads. On one such forum we found entitled “GodLikeProductions,” visitors complained about the automatically downloading app, but those messages were either removed or ignored by the forum's hosts, allowing the problem to perpetuate. In this particular instance, the app uses the insidious mask of a "security update" to get a user to complete the installation. Here is our detailed analysis of how the malicious app works. We were not able to locate the ads that were spreading this malicious app, but we did capture the Android Package (APK). The APK, known as “kskas.apk,” portrays itself as "Ks Clean," an Android cleaner app, upon installation. Once installed, the app displays a fake system update message in which the only option presented to the user is to select the "OK" button, forcing the user to accept the message. Fig. 4: Payload app - "update.apk"
Once the app gains admin rights, it becomes impossible to remove it from the device. The traditional "Uninstall" option, by default, becomes disabled, because a user cannot remove apps with admin rights. Usually, one can uninstall such apps by first removing admin privileges via settings, but this app uses an unconventional method — registering as an Android receiver — to preserve its admin privileges. An Android receiver is an Android component that gets triggered in accordance with registered events and actions. In this case, it registers a receiver for an event titled, "DEVICE_ADMIN_DISABLED," which locks down the device for few seconds whenever the user tries to disable admin privileges. We also noticed that the app connects with its Command & Control (C&C) server to fetch the various parameters it needs to operate. In the decrypted response, we can see the "update_content" parameter contains the message that will be shown to the user (see Fig. 1). It also receives an update interval to update its dynamically loaded .dex (present inside .jar) and a native library (.so) file. The dynamically loaded .dex file is responsible for advertisement-related activities and the .so file runs a daemon process, which helps the app execute even if the app is force closed. The dropper app frightens the user with a message saying that there is a security loophole in the device and the user must install an update in order to prevent the loss of account and personal information. The update app asks for administrator privileges; if granted by the user, there is no way to revoke them. After that, there is nothing that can stop the malware from popping the ads even when the user is using other apps.